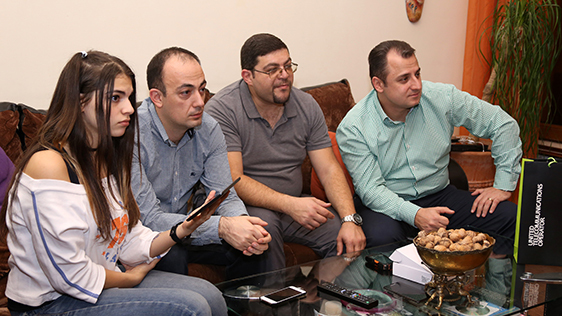 On New Year’s Eve the representatives of Ucom have visited the family of one of the first Triple Play offer subscriber, Mr. Arman Stepanyan, and launched Mediaroom Mobile TV application on a gift tablet. Mediaroom special application is one of the most in-demand over-the-top services and innovative solutions among Ucom IPTV users in Armenia. It is an important part of U!TV subscription, allowing to instantly watch thousands of TV programs and movies right on a smartphone or a tablet screen. “On New Year’s Eve we took a decision of a surprise visit and a nice gift for one of our dear customers, who was among the first subscribers joining Ucom’s Triple Play offer. The Mediaroom application, preinstalled in this gift tablet, enables you to watch the TV content of the most interesting and favorite TV channels on the screen of your portable device, regardless of location”, - said Tigran Safaryan, the director of marketing and communications at Ucom. “We have announced the launch of this application in the USA and now we are happy, that from now on our U!TV subscribers living in Armenia can also pair their portable device and a TV-set and get the best experience anywhere, anytime by watching all long-awaited and important programs, movies, series, cartoons, football games, etc.”, - noted Aram Barseghyan, the commercial director at Ucom. Let us note, that in order to benefit from Mediaroom application it is required to be a U!TV subscriber, get a TV-box, go to the Extras, generate a 9-digit code to insert into the window on the portable device screen, pair the TV and portable devices and start enjoying the best media-content immediately on the screen of a smartphone or a tablet. The Mediaroom app allows managing all the TV-boxes in the house, watch the TV-content on a portable device, control the TV-set with virtual remote control, use a 2-day catch-up service, and watch the electronic program guides of the channels and the programs anywhere with an internet access, at any time.